The residents described « a mini-tsunami ». A toxic one. Last Monday, the red mud reservoir of an alumina plant ruptured in Hungary, near Ajka, 165km west of Budapest. As a result, 1.1 million cubic meters of red mud wiped out several villages through waves more than 2 meters high. It flooded 40 square kilometers of land, including affluents of the Danube, then reached one of Europe’s longest river on Thursday morning. So far, 7 people have been killed, 1 is still missing, and more than 150 have been injured, mostly by chemical burns. The death toll is still expected to rise. As we write these lines, surrounding villages are being evacuated as the structure threatens to break in another point, which would result in another 500 000 cubic meters flooding the area. The disastrous chemical accident has been declared Hungary’s largest and most dangerous environmental catastrophe, exceeding by far the 130000 cubic meters of cyanide-tainted water that spilled in 2000 in Baia Mare, Romania. Ten years later, traces of cyanide are still found in the area. It is worth noting that this cyanide was in a liquid form, therefore very quickly carried aways by the river whereas the thick red mud will sit there for years, sipping into the ground and reaching ground waters. 184 000 000 gallons of red mud have been released. The amount makes the event comparable to the recent oil spill in the Gulf of Mexico where 200 millions gallons had been released. The Danube, Europe’s second-longest river running through 2850 kilometers (1771 miles), marks the border between Hungary and Slovakia. It flows through Croatia, Serbia, Romania, Bulgaria, Ukraine and Moldova before reaching the Black Sea. Countries bordering the Black Sea also include Turkey, Georgia and Russia. It is the base of unique ecosystems and has a thriving fish life that also provides food for other animals, including humans. The alumina refinery, named Timfoldgyar Zrt, belongs to MAL Zrt, the Hungarian Aluminium Production and Trade Company. MAL Zrt also has shares in alumina companies in Bosnia, Slovenia and Romania. 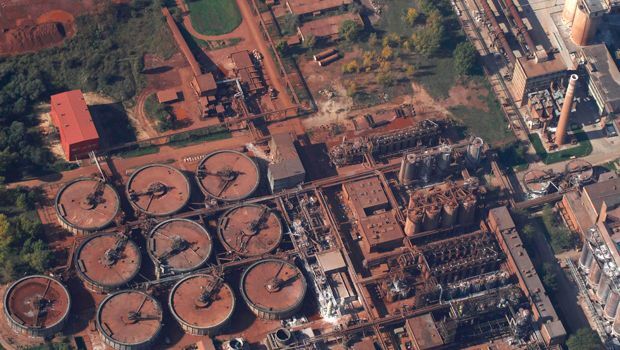 Apart from alumina, it also exploits bauxite to extract synthetic zeolites and the rare element gallium, making it one of the world’s primary producer of gallium. Hours after the catastrophe, MAL Zrt insisted that « under European Union guidelines, red sludge is not considered hazardous waste and its components are not water-soluble », then declared that their intention was to restart production over the week-end. It’s a rare enough occurrence that it deserves to be noted : for once, we can agree with a government official. The government took control of the firm. Zoltan Bakonyi, CEO of MAL Zrt, has been arrested. What is Red Mud ? Hungary, following the path many European countries took between World War 1 and World War 2, started mining bauxite in 1927. Between 2005 and 2008 it still had a production of roughly 55 000 tons, as well as 3 refineries. Bauxite is the raw product of aluminium. The process, known as the Bayer process, involves « digesting » bauxite under pressure with caustic soda to form sodium aluminate (Na2 AIO2). Filtering this solution produces aluminium trihydroxide, and separates it from the waste product, red mud. This trihydroxide is then washed and calcined to produce alumina powder. ». « Roughly speaking, a refinery uses 2.3 tons of bauxite to make one ton of alumina powder, leaving over a ton of toxic red mud. » « In the smelter (…), 2 tons of alumina yield one ton of aluminium ». More precisely, it contains 22 radioactive elements, sodium, lead and possibly cadmium and thorium. 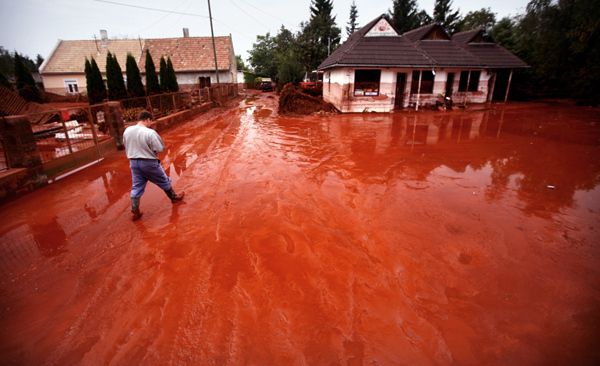 Environmentalists have already recorded high levels of mercury, arsenic and chromium in the hungarian red mud. Arsenic level in water extracted from Kolontar (one of the nearest village) on Tuesday were 25 times higher than the legal drinking water limit. Herwig Schuster, a chemist, said “the arsenic level was double what is usually contained in such red sludge”. … as well as caustic. Environmental groups measured the Ph of the sludge and say it’s highly alkaline, meaning it’s « incredibly corrosive » and « caustic ». The Ph was recorded over 11. As a comparison, Ammoniac has a Ph of 12, Bleach a Ph of 13. Since the beginning of the spill, fishes in the rivers that have been contaminated have died massively. All life in the nearby Marcal river has been killed off, white froth has been seen floating on the Danube and many dead fish have been washed ashore. The authorities declare that the Ph is decreasing as the red mud mixes with the Danube’s waters. Although the Ph will decrease as it flows down the river, the heavy metals won’t disappear and they’re expected to lead to massive death of fish and enter the food chain. The effects of red mud on human health and on the environment are well known, especially to those working or living nearby alumina plants. High rates of lungs, stomach, skin and eyes disease, as well as birth defects are recorded. Other areas of alumina production include Orissa, a northeastern state of India. There, the pollution around Damanjodi and Panchpat Mali is essentially due to bauxite dust, toxic red mud and factory smoke. 3 people went blind from being exposed to the red mud toxic slurry while trying to rescue their cattle. The catastrophe also sparked discussions in Jamaica, bauxite’s 3rd extractor in the world, over the safety of such red mud reservoirs. Much more to be worried about. The factory owned by MAL Zrt is the biggest alumina plant in Hungary, employing 1100 people. They have received clear instructions for a « no comment » policy regarding media. As production is temporarily stopped, the employees are working on cleaning up the villages. The pictures that have been published clearly show that only members of the army are wearing appropriate chemicals proof suits, while the rest of the population is left with dust masks. We haven’t been able to get images of the employees, but the catastrophe let us assume that safety is not one of MAL Zrt’s priorities. As the forecast announces hot weather and strong winds in the coming days, part of the red mud is expected to turn into toxic dust, thus spreading over an even larger area and worsening the environmental and health damage. This red dust is known to cause acid rain. On the subject of safety, the WWF published aerial pictures of the tailings dam number 10 (the one that failed) taken in June. The 300 by 450 meter reservoir showed a significant leak. If proof was needed, this shows that the authorities as well as the company have been caught red-handed. Nevertheless, MAL Zrt still insists it has « done nothing wrong ». WWF also declared: “We are particularly concerned about the much larger reservoirs at Almásfuzito, built over earthquake prone swamp land right on the river bank just 80 km upstream from Budapest, where all sorts of other materials seem to have been tipped into the alumina processing waste ponds.” These reservoirs hold 12 million tons of red mud. This image shows the main toxic waste storages around the Danube, which could potentially affect 796000 square kilometers around the river. These include two refineries in Serbia, as well as a 20 hectares storage of red mud in Romania. The romanian reservoirs have already leaked in the past, and are presented as “one of the most dangerous” site by the WWF. We won’t bother publishing here the amounts of money the government and MAL Zrt have been making available to make up for their irresponsibility. No amount can make up for the loss, let’s not allow them buy themselves a clean conscience. Although Timfoldgyar Zrt is the biggest hungarian plant, it ranks 53rd on the scale of global production of alumina. As shown above, the production of red mud is vastly superior to the production of aluminium. With more than 24 millions tons of aluminium produced globally only in 2007-08, the figures bring us to 48 millions tons of red mud. How many more of these dams are waiting to burst ? How many mountains do we destroy a year, how many ecosystems do we wipe out, how many plants, animals and people do we poison ? How many more catastrophes do we need to stop bauxite exploitation and heavy industry ? Most quotes are taken from Felix Padel and Samarendra Das’ essential book « Out of this Earth ». Many thanks to them. It is so very scary to read all these articles about the aluminum production around world and its toxic side products that are dumped in our waters and ground. In fact the scariest is that us people how easily are manipulated by money and how much our vision is hastened by potential monetary advantages. I’m a Hungarian born and only can congratulate to the Hungarians to make the arrests of those who were irresponsible using their power. Arresting the irresponsible parties is not revenge, but hopefully provides a lesson learned for generations to come. My heart goes out to all of the victims and their families who paid the ultimate price of capitalism.